There's a new Studio Movie Grill coming to Colleyville! It just opened May 27th. 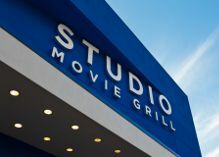 If you're not familiar with Studio Movie Grill, they have 100% digital projection, with restaurant quality food and beverage from an American Grill menu and full-service bar. Instead of going to another theater where they overcharge for popcorn and soda, Studio Movie Grill offers more. Visit any one of their locations for an unmatched movie grill experience combining quality, value, and selection for the whole family. For movie listings, showtimes, and directions to our theaters, please visit studiomoviegrill.com. You can use promo code SMGFamily to get a $5 movie ticket to any movie of your choice!